Today, Sonoma Valley is at the forefront of California’s wine industry, known for growing everything from Pinot Noir to Chardonnay grapes. However, the city also has a rich past including the mission period as well as Mexican colonial history. It’s the perfect place for a relaxing weekend getaway. The town is slow paced, and a bit more casual than it’s Napa Valley neighbors. We enjoyed a couple of days there and have compiled a list of some great places that we visited. We hope you check them out next time you are in wine country! MacArthur Place Hotel & Spa– If you are looking for an indulgent, wine country-esque place to stay, MacArthur will not disappoint. Their rooms are spacious and the Garden Spa Suites even have outdoor soaking tubs and showers…you can’t get more luxurious than that! The grounds and gardens are just as, if not more beautiful than the rooms. You’ll love meandering along the paths, playing a game of checkers, or giant chess, and creating your own zen garden. The spa is not to be overlooked either. We had one of the best massages ever at the MacArthur spa. Olea Hotel – For a peaceful retreat, or romantic getaway, book a room at Olea Hotel in Glen Ellen. This family run hotel is kind and welcoming. Their rooms are fresh and modern and the bathrooms even have heated floors which was quite a treat after a cold hike. Their garden and hot tub area is beautiful in the springtime when we visited, but we imagine it would be a cool oasis in the summertime. One of the highlights of our stay at Olea was their gourmet two course plated breakfast. This, along with their breakfast buffet and homemade chai is the perfect way to start a day. Sonoma Valley Inn– For those of you who want something comfortable and with a smaller price tag, check out Sonoma Valley Inn. They are located just a block away from Sonoma Plaza and have all the essential amenities for a great stay. They are also pet friendly and serve continental breakfast every morning. Our favorite part of our stay was renting bikes to ride around downtown. We also sipped on some wine after hours while relaxing at their lovely outdoor fire pit. A perfect night cap! The Renaissance Lodge Resort & Spa – Visiting the Renaissance Lodge is a vacation in itself. You can choose between staying in the main part of the hotel, or if you’d like something more private, book a cottage. They have a beautiful pool area, a restaurant, and of course a Spa. We had wonderfully relaxing treatments at the spa. Make sure to arrive early so you have ample time to enjoy the spa garden area complete with 4 pools and multiple cabana areas to hang out. An Inn To Remember– If you’re looking for something close to the plaza and as cute as a button this place is perfect for you. Tucked away on a small side street just minutes from Sonoma Plaza, each room in this small Inn has its own character and specialties. We stayed in the Mimosa Suite that had our own private patio completed with a fountain and an in room light Italian breakfast delivered in the morning. The suite has a King Bed and a Whirlpool Tub which is perfect for relaxing and enjoying the room. The Inn also provides complimentary bikes and wine tasting cards- not much more you can ask for! Wine Country Retreat Airbnb – We got the chance to stay in this totally cute/instagramable home in Glen Ellen. It is perfect for two couples to get away for a weekend. You’ll love the outdoor dining space, open garden, and retro vibe of this place. It’s open, airy and a great alternative to staying in a hotel. Cook in and enjoy an al fresco dinner on the patio, or drinks by the fire pit! The host, Meri is a delight and full of Sonoma Valley knowledge, but is perfectly respectful of guests privacy. Sunflower Caffé – The Sunflower Caffé is the perfect brunch spot located right on the Sonoma square. They have an adorable patio with plenty of shaded seating for intimate or large groups. We loved all of their dishes, especially the breakfast sandwiches and tomato soup. They have a pretty large menu with plenty of sweet and savory options–something for everyone! Girl & the Fig – Located on a quiet corner in the Sonoma Square, The Girl and the Fig is a Sonoma staple and rightly so. We’ve heard this place mentioned many times and finally got a chance to enjoy an amazing lunch there. They are open every day of the week and serve breakfast on Saturday and Sunday. We started our meal with off with a cheese and charcuterie board and with the first bite we knew we were in for a great meal. If you are unsure of what to order, go with their staple dish, Wild Flounder Meunière which was perfectly cooked and is the perfect size to fill you right up. The Fig Cafe is owned by the same owner of the Girl and the Fig- Sondra Bernstein. It opened in September 2003 and features country French-home cooking, a great by-the-glass wine list, wine flights, and unique wine cocktails. The menu is fresh and delicious! The restaurant is family friendly, but they don’t take reservations so be sure to get there early! They also have a non-corkage fee, so feel free to bring along your favorite bottle. Glen Ellen Star – The star of the town is the only way to describe Glen Ellen Star. This amazing eatery is only open for dinner and once the doors open, the tables fill up until the night ends. We had the pleasure of eating at the chef’s counter and watching the chefs dance around the kitchen while whipping up tantalizing morsels for hungry onlookers. A must have is the woodfired cauliflower with salsa verde- SO GOOD. If you hesitate at the combination of flavors, don’t think and just order. If you are there on a Wednesday, it’s neighborhood night and there’s a great deal on a set course meal with complimentary corkage all night. Cafe la Haye is the perfect Sonoma restaurant. It has been there for years and is a staple in the Sonoma downtown plaza area. The quaint restaurant served delicious American cuisine and has been featured in many publications such as The Wine Spectator. We enjoyed a quiet and relaxing meal with a glass of local wine that paired perfectly with our dish! Park 121– Park 121 is the only restaurant located at Cornerstone. They offer both indoor and outdoor seating and their menu is seasonally fresh and continually changing. We loved their antipasti’s, duck salad, and artichoke ravioli. The food is a perfect reflection of Sonoma: laid back, and unpretentious, yet very satisfying. Hopmonk– Hopmonk has a couple locations around wine country but we had the pleasure of having lunch at their Sonoma tavern. They have beers on tap, outdoor seating, live music, and great tasting bar food to satisfy your hunger– Hopmonk has it all! We really enjoyed their great outdoor space on a warm spring afternoon. There was plenty of seating with a cool breeze blowing through as we ate our meal. We loved the calamari here with its thin crispy crust along with a nice glass of beer to wash it all down. 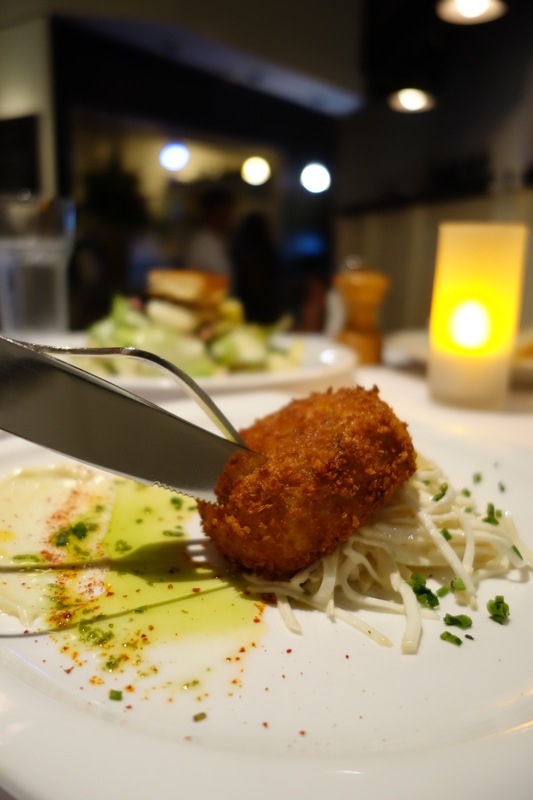 Lasalette– This gem of a restaurant is tucked away in an alley off of Sonoma’s main square. They serve modern Portuguese cuisine, which is vastly different than other restaurants in town. We started the meal off with delicious Queijo do São Jorge cheese, which was made in house which we highly recommend ordering. We also loved the Portuguese Fisherman’s Stew and of course, their Portuguese sweet rolls…yum! Carneros Bistro – Carneros Bistro is a California eatery located on site at the Renaissance Lodge in Sonoma. The have a great Farm-to-Table menu served in a high ceiling, airy restaurant. We had the perfect dinner here after a long day of driving and wine tasting (not at the same time!). We loved the fact that they have a variety of small plates so we could share and taste a bunch of different items. We enjoyed the curry mussels they had on the special, but go with what your stomach tells you! Tasca Tasca– Is a Portuguese Tapas Restaurant & Wine Bar located right next to the Sonoma Plaza. Tasca means tavern or pub in Portugal and the place is decorated with a beautiful rustic feel with its high ceilings and long bar. The menu is great for sharing since you get to pick from a number of different types of tapas which is then served on a wooden platter for all to enjoy together. We love tapas since we get to try a variety of different foods and the great wine list was the perfect compliment to our meal. Della Santina– This delicious Italian Restaurant is a must visit when in Sonoma. Founded in 1990, this place has been around for a long time and is there to stay for a lot longer- from their housemade pasta to fresh seafood, hand picked wine list, rotisserie meats, and much more, this place is sure to fill you up and leave you happy and satisfied. They make almost everything from scratch including their own olive oil and cured meats. Make sure to make a reservation since this place is usually packed every night! Valley of the Moon offers an amazing food and wine pairing that you won’t forget. Named after the block of 120-year old Zinfandel vines growing outside of Estate Chef Sam Badolato’s kitchen window, Window Block Kitchen offers a tapas-style à la carte menu and a four-course chef’s choice menu. Both are paired with wines and focus on community-sourced, seasonal ingredients that highlight Sonoma County. The menu changes seasonally and Chef Sam’s knowledge about how food and wine compliment each other can be tasted in every course. Sit outside right along the vines and get ready for an experience! Lake Sonoma Winery– As if delicious tasting wine wasn’t enough, Lake Sonoma Winery also hosts a Paint Night in their beautiful tasting room that was once a Sonoma home. It’s perfectly located in a hidden nook off the main square. Their tasting room is just the right size for a personalized tasting. We visited on paint night and really enjoyed it. Time flew by as we let our creative juices and the wine flow! Corner 103– This is a wonderful stop for those of us who want to learn about the “art of wine tasting and pairing”. We had a lovely time with owner, Lloyd, who broke down the the essentials of wine tasting: how to taste wine, what glass it should be served in, the correct temperature at which it should be served, and how wine and food work together to bring out distinct flavor characteristics. The wines are made to emphasize the original characteristics of each type of grape, making each wine simple and straight forward in taste. This helps guests narrow down the types of grapes they prefer. We loved how Lloyd explained that everyone’s pallet is different and there really is no right or wrong in great wine…just personal preference! Pangloss Cellars– This tasting room is located right in Sonoma Plaza. It’s spacious with high ceilings and is beautifully decorated with a live olive tree growing up from the ground right into the building. We recommend grabbing a seat in one of the many couch/lounge areas for a tasting experience with a private host. It’s a great place to just relax and converse with friends. Pangloss offers small-plate food pairings to go with each wine flight which we recommend trying. We were impressed with both the White Flight & Caviar pairing and the Bordeaux Flight & Paté pairing. Their wines are elegant and smooth with affordable pricing. Mayo Reserve Room -It’s always a good idea to eat while wine tasting. The Mayo Reserve Room is one of the few places in Sonoma Valley that offers a food & wine pairing. Chef Frumpkin will take your taste buds on a journey with 7 wines, each perfectly matched with a culinary treat. Each “bite” is actually pretty substantial and the whole tasting could serve as a light lunch. Benziger Family Winery – Benzinger is a well known name in the Sonoma Valley and their farming practices have come a long way since they first opened their doors in the early seventies. They care for the land and their whole vineyard is now biodynamic, it’s own little ecosystem. They have a variety of winery tour and tasting options. Their tractor tours give you a great view of the whole property and are fun for adults and kids. VJB Cellars – If you are looking to have lunch, in between wine tastings, VJB Cellars is the perfect stop. They blend amazingly delicious Italian style wines, which is unique to find in the Sonoma Valley. In the same building as their main tasting room they have an Italian style deli, perfect for picking up lunch to enjoy on their patio. If you want hot foods, they offer tasty wood fired pizzas, paninis, calzones and more. To top it off, they even have a pasta shop and wine truffle shop on premises as well. There’s something for everyone to enjoy! Gundlach Bundschu– For six generations and over 150 years, the Gundlach Bundschu family has farmed the Rhinefarm estate vineyard, located where Sonoma Valley, Carneros, and Napa Valley meet. We loved walking around their grounds, which include a pond, picnic areas, and hiking trails. They also host many music events throughout the year. Grab a bottle, your dog, and loved ones to have a great day in the sun! Quarryhill Botanical Garden – We’ve visited Sonoma Valley plenty of times before we even knew this gorgeous place existed. Quarryhill has an array of rare and beautiful East Asian flora and focuses on conservation and education. There are 25 acres of gardens to explore. These trails feature hidden places to sit and relax, ponds, waterfalls, and vistas of the Sonoma Valley. It’s a wonderful place spend an hour or two walking around–a nice break from all of that eating and wine tasting! Cornerstone– This is a fantastic first stop on your Sonoma trip. It’s located on the outskirts of town and houses gardens, shops, wine tasting rooms and a restaurant. There is something for everyone. The Gardens contain installations created by artists and are truly stunning. Everywhere you turn there will be an “Instagram-worthy” shot! In mid-May, Sunset Magazine will be revealing their new gardens and outdoor kitchen, also located on the property. Entry to the gardens and property is free for everyone. For vintage decor lovers, Chateau Sonoma is a fantastic place to shop for home goods. The owner shops for hidden treasures in France and brings them back to Sonoma to share with us Califonians. The shop is simply beautiful and smells divine too! To try out some local wine, check out the Keating Wines tasting room. It’s one of three located on the Cornerstone property. This is a small production winery, that produces about 1,000 cases of wine annually. The owner and winemaker is almost always in the shop, so it’s a great chance to speak with him and ask questions. Jack London State Park – If you’re in need for some nature or a break from wineries, Jack London State Park is the perfect escape. This park is easily accessible and takes you into a magical time of the past. When we visited on a slightly drizzly day, the forest and vineyards were shrouded in fog with birds chirping here and there. Wander around the grounds and learn about the amazing history behind the abandoned stone structures. Or visit the old vineyards that are still producing grapes in the middle of the forest. Be prepared to spend more time than you anticipated! There’s just so much to see and enjoy! Sonoma Wildflowers– Sonoma is a great place to see wildflowers and the time is now! We stopped by Madrone Vineyards Estate to get the first photo below and then again just along the roadside (second photo). According to legend, a Franciscan missionary first spread mustard seed while landscaping church properties throughout California. Many wineries plant flowers to help protect their crops. Mustard plants cover the crop, and act as a green manure releasing nitrogen into the soil. The seeds are so hot that they repel insects. Sonoma Plaza – Sonoma’s historic Plaza is a square that acts as the gateway to Sonoma County. Here you can find a sundry of restaurants, tasting rooms, galleries, and some great historic sights and buildings. It’s home to Mission San Francisco Solano and is the location where the Bear Flag Revolt took place, which eventually led to the start of the Mexican-American War. You can spend a few hours just walking around, visiting shops and tasting wines. Take some time to relax and meander in the park with the ducks, or enjoy a fantastic meal. Sonoma Biking– Biking is a great way to see and enjoy everything around you. Sonoma is very cyclist friendly with bike rentals available all around town and numerous bicycle races and events taking place there every year. Sonoma is filled with parks and bike paths to explore. Try biking between wineries for some exercise, or take a light ride around the square! Sonoma Valley Museum of Art-If you appreciate modern art, make sure to stop by this museum located in downtown Sonoma. The exhibits continually change every 3-5 months and the art on display is very creative and unique. When we visited, Contemporary Japanese Bamboo Art and Contemporary Calligraphy were on display. This summer they are welcoming in a surfboard art exhibit! General admission is $5, but every Wednesday admission is free for everyone. Fairmont Sonoma Spa– Willow Stream is located in the lovely Fairmont Sonoma Inn and Spa. They are rated among Travel + Leisure’s top 25 spas and is built on top of an ancient thermal mineral spring. The spa has indoor and outdoor heated pools, fireplaces, saunas, and heavenly massages to cater to all your relaxation needs. This is the perfect place to relax and rejuvenate to wrap up a perfect weekend in wine country. Great post! Thanks for the recommendations, heading to Sonoma this weekend, can’t wait to check out the sights!